Despite the lack of good rest from the 3-day mountain adventure I just had [read the account of my Mt. Apo adventure here], I flew to Cagayan de Oro City the following morning to submit myself into yet another exciting trip. Camiguin Island in Northern Mindanao is the next travel destination. En route to Cagayan de Oro. 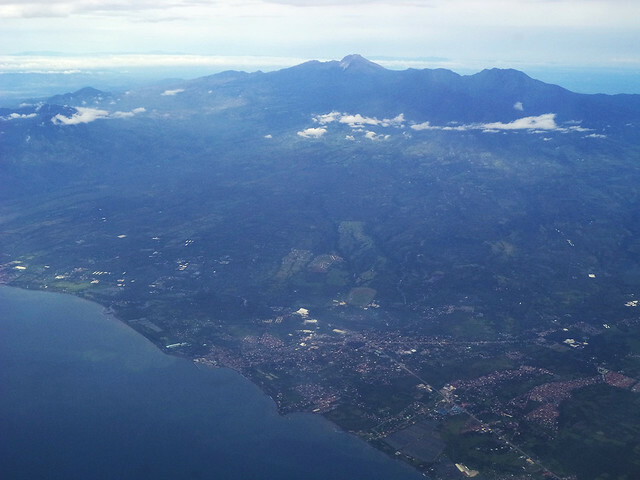 Davao City beneath the shadow of Mt. Apo. 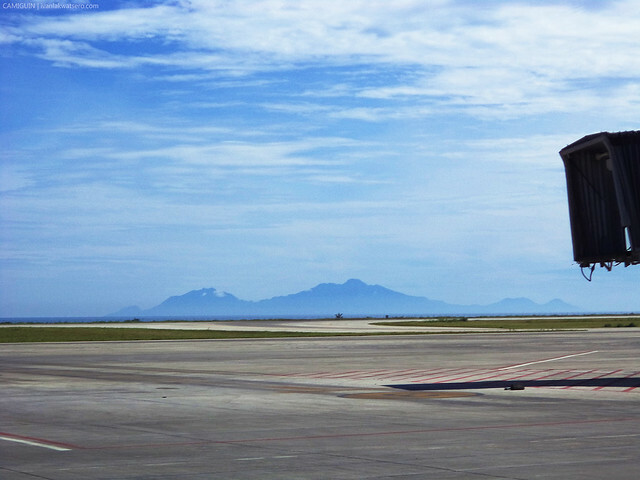 Coming from Davao Airport, I reached the newly opened Laguindingan Airport at around 8:30 in the morning. It was my first time to land there, and I was kinda impressed. 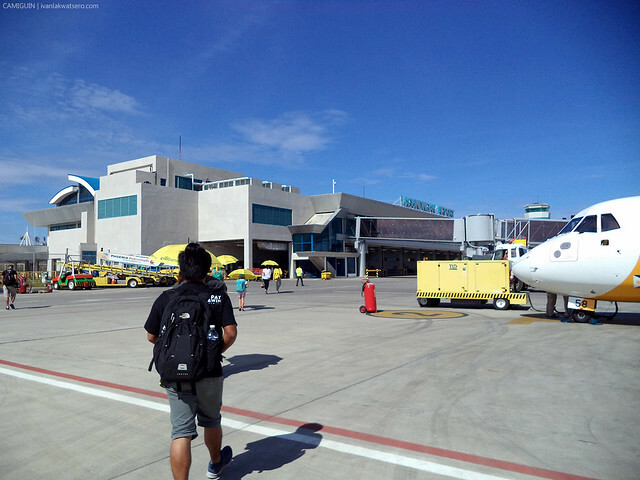 Compared to the Lumbia Airport (old CDO airport), this one is a lot bigger and in tune with the times. 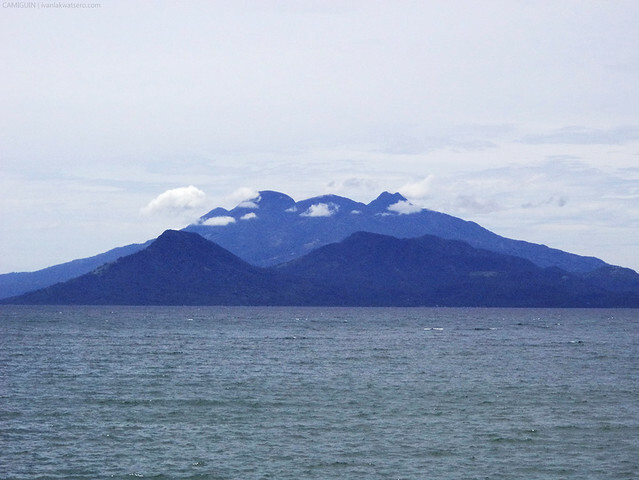 From the tarmac, I can see clearly the rugged peaks of Camiguin Island, our destination! Great weather ahead of us. As soon as I got out of the plane and reunited with my bag loaded with a week worth of stuff, I went out to look for my friend, Arisse, who came all the way from Manila to join me in this would-be awesome trip. She arrived an hour earlier than me so I expected that she's already waiting for me at the arrival area. Not a minute had passed and I found her. Of course, nothing excites us more than the thought of setting foot on Camiguin Island, the island paradise we've been yearning for the past 2 months. From Laguindingan Airport, Arisse and I traveled to Cagayan De Oro city by a chartered car (Php800). I know this is not the wisest and most practical means of moving out to the city proper, but since it's the easiest way (by that time), we took it. (Note: There are now more shuttle services linking the airport to CDO city). The travel lasted for an hour, and by the time we arrived at Agora Market, we're just in time for lunch. Things got easier once we reached Agora Market. All the buses can be found there, whether you're west-bound, south-bound or east-bound. In our case, we're Camiguin-bound, so we hopped into an east-bound bus (Butuan) as it will bring us directly to Balingoan Port. Travel time is more or less 2 hours. Butuan-bound buses has a pick-up terminal in Balingoan, which happens to be the midpoint of CDO-Butuan route, and also, our destination. Great! So when our bus stopped there for like 10-15 mins, we alighted and walked to the port which is just a few blocks away. Again, we're just right in time. 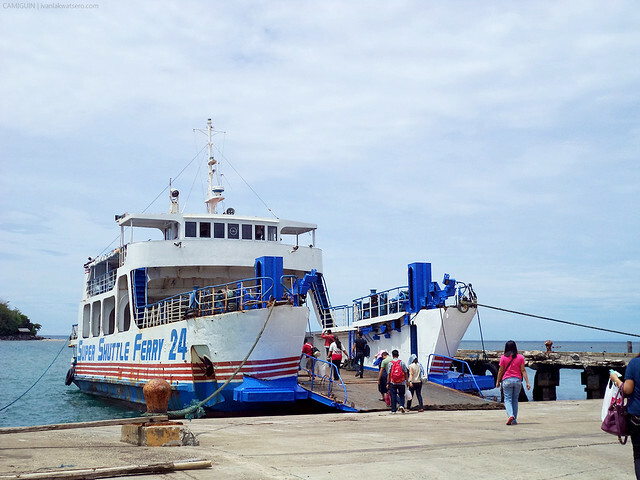 Upon reaching Balingoan port, the next trip to Camiguin (Benoni Port) was about to leave. At ang nakakatuwa pa, student fare lang ang siningil samin! Ayos! Camiguin Island, a closer look. The Island Province of Camiguin in Northern Mindanao, is the country's second smallest in terms of population and land area. It is dubbed as the "Island Born of Fire", since it is indeed an island created by volcanic activities, just like in the case of Hawaiian Islands. The province is famous for its sweet produce, the Lanzones, many underwater paradise, as well as exciting hiking destinations and white sand beaches. It was around 3PM when we landed in Benoni Port. Syempre, excited na akong mag-lagalag! I wanted to explore the beach, do all my hiking, eat food and just chill. Simply put, we will, most certainly, maximize our 4-day sojourn in the island. Good thing, we already planned out beforehand a good itinerary for this trip, properly picked what's in and what's out, kaya wala na kaming pinroblema pa.
Mang Ronald (09106593349), our guide/service for all our activities in Camiguin Island, was already waiting for our arrival in Benoni. It did not take time for us to see him, the cheerful guy with white motorbike, among the group of men in 30s and 40s whose eyes were on us (madami silang mag-ooffer ng tour package sa mga bagong datin na wala pang plano). He first introduced himself, then brought us to our temporary home in Mambajao for the next few days. Despite the busy day, which was mostly spent on the road to Camiguin Island, the two of us still wanted to do something on our first day in the province. Sayang kasi yung time, at hndi naman kami masyadong pagod. So rather than spending the remaining hours of the day doing nothing, we opted to visit one of Camiguin's most famous landmarks—the sunken cemetery. Mang Ronald came at around 4:30 PM to fetch us. I think, our visit was just timely as the sun will soon be falling down. So, on his motorbike (nagkasya kaming dalawa sa likod, ayos! 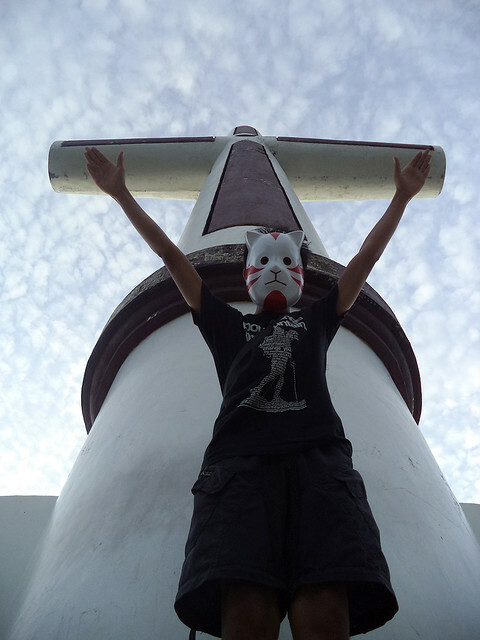 ), we traveled westward to the province's famous landmark. It was roughly a 15 or 20 minute ride through the scenic coastal road of the island. The sun was about to set when we reached the docking area. Perfect! we had to ride this bangka to get to the island (Php10 per head). Me and my friend, Arisse. Behind us is Mt. Vulcan. According to the locals, a once thriving coastal town and cemetery sank beneath the waves when a series of eruptions (of Mt. Vulcan) occurred through the course of the 19th century. 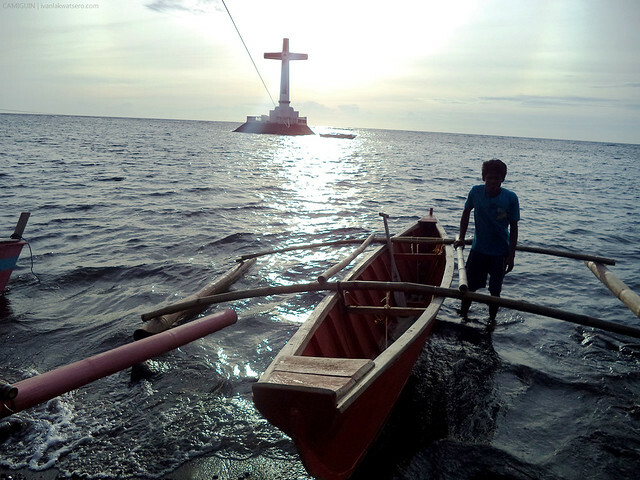 What remained was a wooden cross, which eventually fell down and also eaten by the sea. 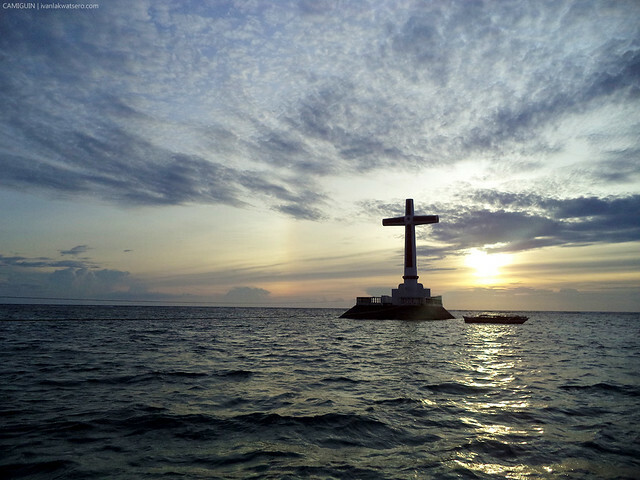 The cross we're seeing today is actually built in the 1980's to remember the sunken town and cemetery. The whole site is now a popular diving site. Old buildings, niches, and tombstones are now covered with colorful marine ecosystems, which is a true haven for diving enthusiasts. the cross, a closer look. 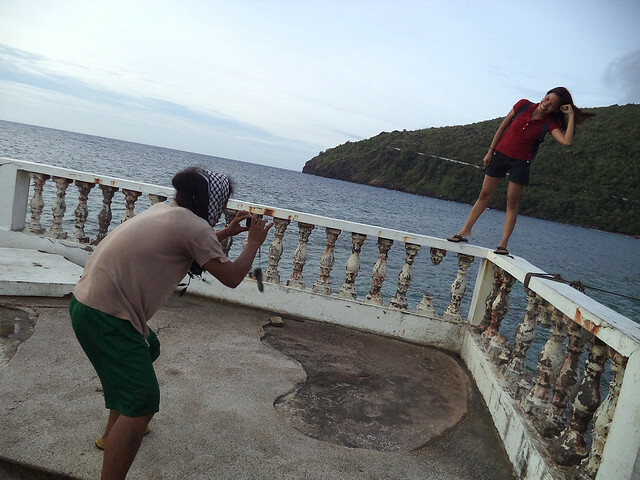 With our jolly boatmen, we spent the rest of our afternoon at the cross island taking wacky pictures and jump shots. Alam na alam na nila kung saan at anong pose ang dapat at nakaka-aliw tlga silang dalawa. 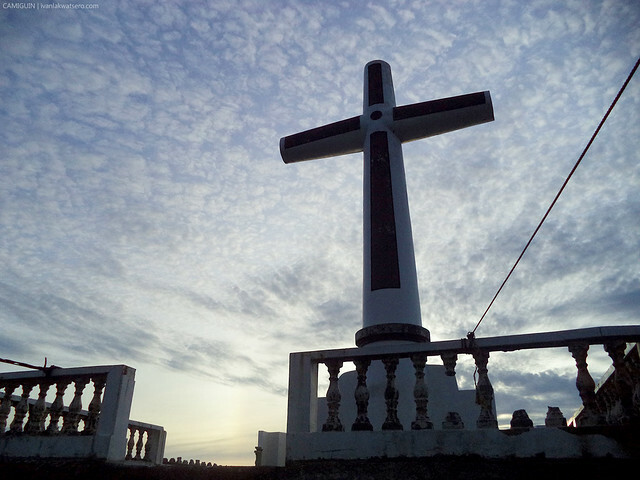 Pardon me for posting some of our touristy shots at the cross. Well, it was our boatmen who asked us to pose that way, sinakyan na lang namin, and it's funny anyway. me doing the "nakapako-sa-krus" pose. 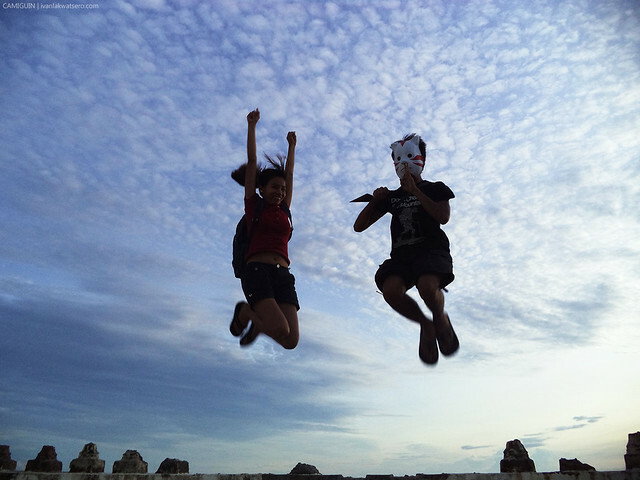 and of course, a jump shot. After the wacky shots, jump-shots and all that jazz, we traveled back to Mambajao for a quick dinner and finally take rest. We had very busy day, and tomorrow, surely, will be more hectic. 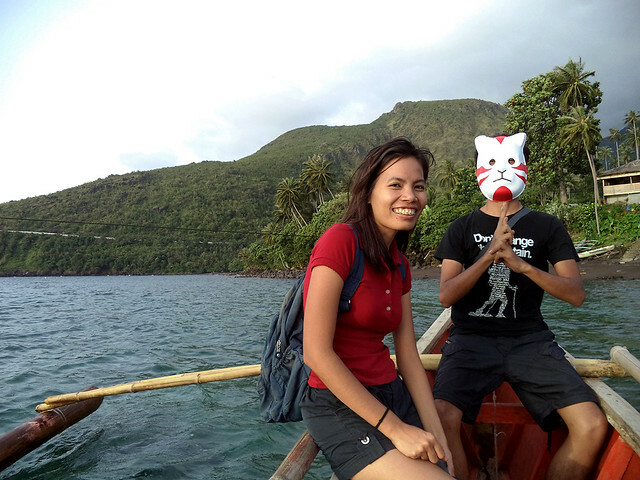 This post is Part 1 of 5 of my Camiguin Island travel series. Check the following links for the other stories.